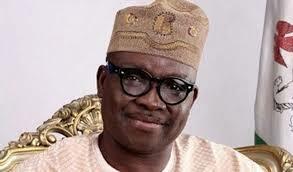 Governor of Ekiti, Ayodele Fayose has reacted to the statement by President Muhammadu Buhari to Governorship Candidate of the All Progressives Congress (APC), Dr Kayode Fayemi over his victory. Buhari had on Sunday in a statement by his spokesman, Garba Shehu congratulated Fayemi for winning the APC ticket to contest the July 14, 2018 governorship elections. Th statement said, “President Buhari believes that Fayemi’s track record in the state as a reformist, with a penchant for building educational infrastructure and promoting the welfare of the ordinary people, will bolster his chances at the forthcoming polls. He wrote “President Buhari congratulating Fayemi on his emergence as APC candidate is like day-dreaming.He will surfer another major defeat on July 14.